Alice Cooper has been scaring children, adults, and churches alike for more than three decades with his daunting image and unique impact on the music industry. 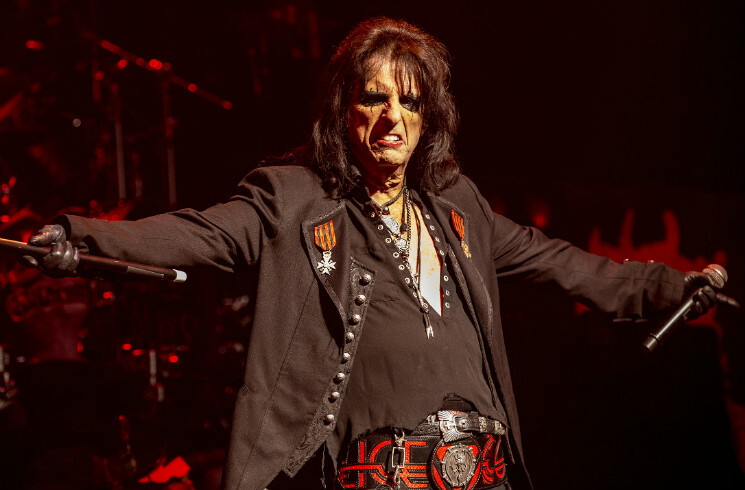 The "Paranormal Evening" with Alice Cooper made its highly anticipated stop in Edmonton last night (August 23), and concertgoers who packed the Northern Jubilee Auditorium were treated to more than a concert; rather, it was a show laden with theatrical antics depicting the terrors inside of Alice Cooper's brain. The evening's presentation would illustrate why he's still one of the coolest guys in rock'n'roll and the true pioneer of shock rock. Like a phantom, appearing through the smoke and dawning the blackest of capes — matching his trademark eyeliner — Alice Cooper stood high and mighty over the crowd. Ripping it wide open and throwing it from his shoulders to discard the ominous attire, not a moment before the cape hit the floor did the opening blast of "Brutal Planet" begin. Keeping the momentum on track, Cooper and crew rolled into "No More Mr. Nice Guy," and enticed the audience to belt along. The first half of the set list included favourites like "Lost in America" and "Poison"; it wasn't until toward the latter half of the evening that the band began to roll out the dramatics. During "Feed My Frankenstein," Cooper was transformed into a ten-foot-tall Frankenstein that finished the remainder of the song. After over 30 years of performing, Alice Cooper's vocal abilities are still on point and show no points of weakness. He's a master of his craft, and it is apparent he holds himself to the highest of standards. The abilities of the band that Cooper had assembled around him were obvious. Although consisting of many musicians from his shared project with Johnny Depp, Hollywood Vampires, the most commanding on stage was guitarist Nita Strauss. Her larger-than-life stage presence was matched by her musical talents throughout the evening. After "Women of Mass Distraction," Strauss took centrestage and began a transcendent solo that showcased her technical capabilities and gritty rock style. After a mini three-part act in which Cooper was bound in a straitjacket ("Ballad of Dwight Fry"), wrestled into a guillotine during ("Killer") and swiftly beheaded ("I Love The Dead") in a mock execution, Cooper came back to the stage toting his own severed head in his hand. He lifted it into the air like a trophy while the intro to "Eighteen" began to blare, before disposing of the head for the evening behind him into the abyss. The night was capped off with an encore of "School's Out," which brought with it massive balloons that were passed around the crowd, as well as endless amount of bubbles and streamers. It was a lighter note to end on for what was otherwise an evening filled with nightmare-inducing events. Alice Cooper linked up with his fellow musicians, bid the audience adieu and vanished into the smoke from which he earlier emerged — until next time.